Overweight is having more body fat than is optimally healthy. Being overweight is a common condition, especially where food supplies are plentiful and lifestyles are sedentary. A healthy body requires a minimum amount of fat for the proper functioning of the hormonal, reproductive, and immune systems, as thermal insulation, as shock absorption for sensitive areas, and as energy for future use. But the accumulation of too much storage fat can impair movement and flexibility, and can alter the appearance of the body. The degree to which a person is overweight is generally described by body mass index (BMI). Overweight is defined as a BMI of 25 or more, thus it includes pre-obesity defined as a BMI between 25 and 30 and obesity as defined by a BMI of 30 or more. Pre obese and overweight however are often used interchangeably thus giving overweight a common definition of a BMI of between 25 -30. There are however several other common ways to measure the amount of adiposity or fat present in an individual's body. The body mass index (BMI) is a measure of a person's weight taking into account their height. It is given by the formula: BMI equals a person's weight (mass) in kilograms divided by the square of the person's height in metres. The units therefore are kg/m2 but BMI measures are typically used and written without units. BMI provides a significantly more accurate representation of body fat content than simply measuring a person's weight. It is only moderately correlated with both body fat percentage and body fat mass (R2 of 0.68). It does not take into account certain factors such as pregnancy or bodybuilding; however, the BMI is an accurate reflection of fat percentage in the majority of the adult population. BVI measures where a person's weight and the fat are located on the body, rather than total weight or total fat content and places emphasis on the weight carried around the abdomen, commonly known as central obesity. There has been an acceptance in recent years that abdominal fat and weight around the abdomen constitute a greater health risk. The person's weight is measured and compared to an estimated ideal weight. This is the easiest and most common method, but by far the least accurate, as it only measures one quantity (weight) and often does not take into account many factors such as height, body type, and relative amount of muscle mass. Skinfold calipers or "pinch test"
A small electrical current is passed through the body to measure its electrical resistance. As fat and muscle conduct electricity differently, this method can provide a direct measurement of the body fat percentage, in relation to muscle mass. In the past, this technique could only be performed reliably by trained professionals with specialized equipment, but it is now possible to buy home testing kits that let people do this themselves with a minimum of training. Despite the improved simplicity of this process over the years, however, a number of factors can affect the results, including hydration and body temperature, so it still needs some care when taking the test to ensure that the results are accurate. Considered one of the more accurate methods of measuring body fat, this technique involves complete submersion of a person in water, with special equipment to measure the person's weight while submerged. This weight is then compared with "dry weight" as recorded outside the water to determine overall body density. As fat is less dense than muscle, careful application of this technique can provide a reasonably close estimate of fat content in the body. This technique does, however, require expensive specialized equipment and trained professionals to administer it properly. The most common method for discussing this subject and the one used primarily by researchers and advisory institutions is BMI. Definitions of what is considered overweight vary by ethnicity. 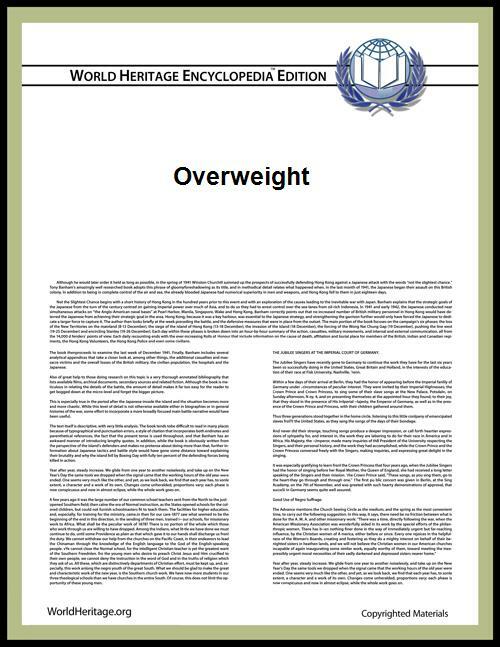 The current definition proposed by the US World Health Organization (WHO) designates whites, Hispanics and blacks with a BMI of 25 or more as overweight. For Asians, overweight is a BMI between 23 and 29.9 and obesity for all groups is a BMI of 30 or more. If an individual is overweight and has excess body fat it could, but won't always, create or lead to health risks. Reports are surfacing, however, that being mildly overweight to slightly obese – BMI being between 24 and 31.9 – may be actually beneficial and that people with BMI between 24 and 31.9 could actually live longer than normal weight or underweight persons. While the negative health outcomes associated with obesity are accepted within the medical community, the health implications of the overweight category are more controversial. The generally accepted view is that being overweight causes similar health problems to obesity, but to a lesser degree. Adams et al. estimated that the risk of death increases by 20 to 40 percent among overweight people, and the Framingham heart study found that being overweight at age 40 reduced life expectancy by three years. A review in 2013 came to the result that being overweight significantly increases the risk of oligospermia and azoospermia in men. Flegal et al., however, found that the mortality rate for individuals who are classified as overweight (BMI 25 to 30) may actually be lower than for those with an "ideal" weight (BMI 18.5 to 25). Being overweight does not increase mortality in older people. ^ Ng, M.; Fleming, T.; Robinson, M.; Thomson, B.; Graetz, N.; Margono, C. et al. (29 May). "Global, regional, and national prevalence of overweight and obesity in children and adults during 1980–2013: A systematic analysis for the Global Burden of Disease Study 2013". ^ "Clinical Guidelines on the Identification, Evaluation, and Treatment of Overweight and Obesity in Adults: The Evidence Report" (PDF). ^ Gray, D. S.; Fujioka, K. J. (1991). "Use of relative weight and Body Mass Index for the determination of adiposity". ^ Craver, R. (10 September 2008). "Location, not volume, of fat found to be key". Journalnow.com. Retrieved 2008-10-09. ^ Gallagher, Dympna; Heymsfield, S. B.; Heo, M.; Jebb, S. A.; Murgatroyd, Y.; Sakamoto, Y. (1 September 2000). "Healthy percentage body fat ranges: an approach for developing guidelines based on body mass index". 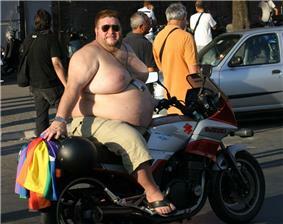 ^ "Being Overweight may be Good for Your Health". Statesman. Retrieved November 26, 2009. ^ Adams, K. F.; Schatzkin, A.; Harris, T. B.; Kipnis, V.; Mouw, T.; Ballard-Barbash, R. et al. (2006). "Overweight, Obesity, and Mortality in a Large Prospective Cohort of Persons 50 to 71 Years Old". ^ Peeters, A.; Barendregt, J. J.; Willekens, F.; MacKenbach, J. P.; Al Mamun, A.; Bonneux, L. (January 2003). NEDCOM, the Netherlands Epidemiology and Demography Compression of Morbidity Research Group. "Obesity in adulthood and its consequences for life expectancy: a life-table analysis". Ann. Intern. Med. 138 (1): 24–32. ^ Sermondade, N.; Faure, C.; Fezeu, L. et al. (2012). "BMI in relation to sperm count: An updated systematic review and collaborative meta-analysis". Human Reproduction Update 19 (3): 221–231. ^ Flegal, K. M.; Graubard, B. I.; Williamson, D. F.; Gail, M. H. (2005). "Excess Deaths Associated With Underweight, Overweight, and Obesity". ^ Kolata, Gina (7 November 2007). "Causes of Death Are Linked to a Person's Weight". ^ Wanjek, Christopher (19 February 2008). "Scientists Agree: Obesity Causes Cancer". ^ Kirschenbaum, Daniel S. (2006). "Effect of Obesity or Being Overweight on Self-Esteem". My Overweight Child. Retrieved 2009-05-20. ^ Flicker, L.; McCaul, K. A.; Hankey, G. J.; Jamrozik, K.; Brown, W. J.; Byles, J. E. et al. (February 2010). "Body mass index and survival in men and women aged 70 to 75". J Am Geriatr Soc 58 (2): 234–41. ^ Flegal, K. M.; Carroll, M. D.; Ogden, C. L.; Johnson, C. L. (2002). "Prevalence and Trends in Obesity Among US Adults, 1999–2000".